Bryce Canyon National Park is open every day of the year, 24 hours a day, weather permitting. There may be temporary road closures due to heavy snowfall and road maintenance. Price of admission is for 7 days and includes unlimited use of the park’s shuttle. Annual Pass - $30 valid for 12 months from time of purchase. This covers everyone in the vehicle and immediate family accompanying on foot, bicycle or motorcycle. The Visitor Center is 1½ miles along Hwy 63, after the national park boundary. 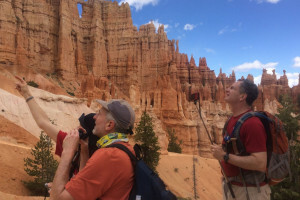 The best months to visit Bryce National Park are between April and June, and September through October, when the temperatures are moderate and the weather is good. Due to the altitude, daytime highs even in July and August are only in the 80s. In January temperatures range from 9-39F. Visit our Weather & Seasons page for more info.